GRANDE BALLROOM Detroit GRANDE BALLROOM photo art print photograph poster for sale. 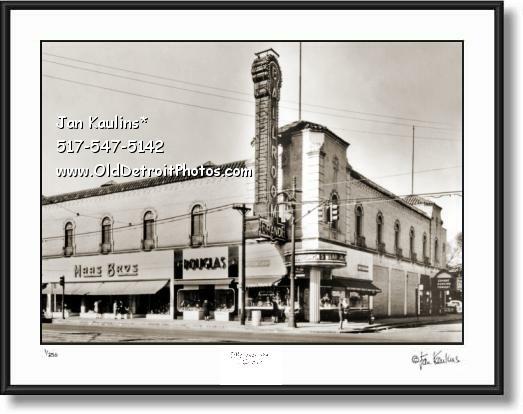 This is a historic DETROIT GRANDE BALLROOM photo picture print for sale of the legendary GRANDE BALLROOM where The Who, The Doors, Janis Joplin, The MC5, SRC, The Cream and many other bands performed in the late 1960's into the early 1970's. The original of this rare GRANDE BALLROOM photo from which this restored image is made was very small and in quite poor condition and not extremely sharp (possibly the unknown original photographer may have partaken of too much of the the good herb to keep his camera steady) so is ONLY OFFERED in the 5x7 (8x10 matt) size and in 11x14 photo size (which starts getting just a bit fuzzy and slightly pixilated). Nevertheless, this DETROIT GRANDE BALLROOM is an iconic image of a Motor City Legend.